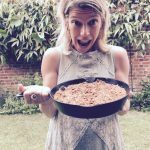 The first time I moved overseas, I left my Great Aunt’s cast iron skillet in storage (shameful! ), but brought my comal. 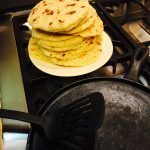 My college roommate’s Hispanic family introduced me to the comal, a flat cast iron pan, in which to heat tortillas on. (Please white people, stop microwaving your tortillas right now! Those chewy things have no contest on a nicely warmed tortilla from the comal). I bought it in San Antonio before we headed to the Netherlands. 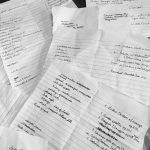 We hosted a number of Tex-Mex nights for the expats I’d met. Using the comal, I made perfect quesadillas for my kids and heated tortillas to accompany homemade fajitas for the adults. Upon learning we were returning to Europe – I decided I’d expand my Mexican kitchen utensil collection while I had a chance. We headed into the Mercado in San Antonio where I picked up a new pair of cowboy boots and a molcajete. I announced my purchase with pride to my roommate’s aunt, who smiled, but raised an eyebrow. “That’s good, mija. But do you know how to cure it?” a mischievous smile tugging at the corner of her mouth. I blinked, “Cure it?” and I shrugged. “I’ll Google it,” and she laughed. As I unpacked the malcajete in my Belgian kitchen, I eye it with suspicion. I am supposed to make food in this thing, but it’s made from volcanic rock, It’s all dusty and dirty. Hum. Well. . . it took days, mis amigos. Days. But by the time I finished curing it, those rock-hard avocados I bought at the Belgian grocery store were ripe and ready to go, anyway. Soak the molcajete overnight in a bowl or tub of water. Grind the rice until it becomes a gritty, grey paste. Put some muscle into it! 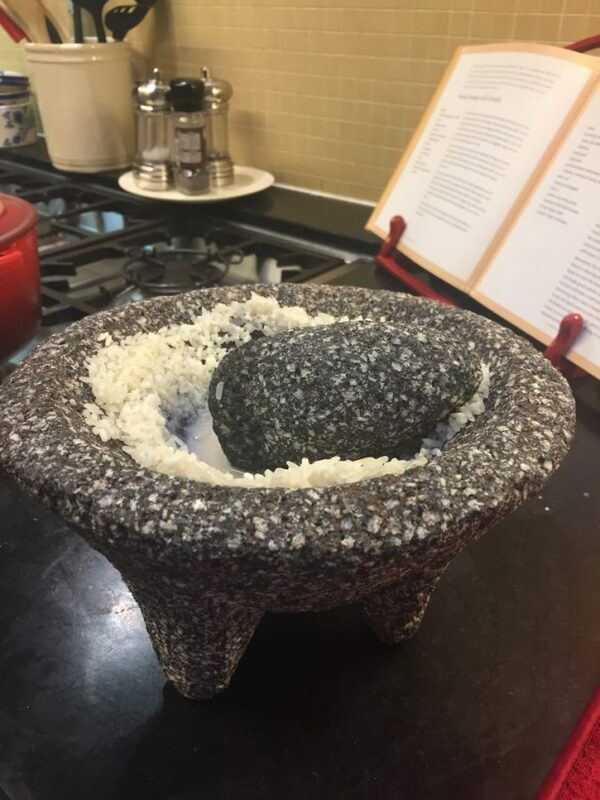 Once the molcajete is clean, create a paste using rock salt, cumin seeds, and garlic cloves. Let this sit overnight so the molcajete can absorb the flavors and rinse in the morning. 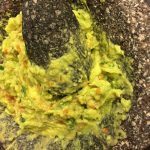 Try making your well-deserved first batch of guacamole in your authentic molcajete!